Rumors, speculation, and spy shots have all been swirling around Chevy’s new Colorado ZR2 off-road pickup. 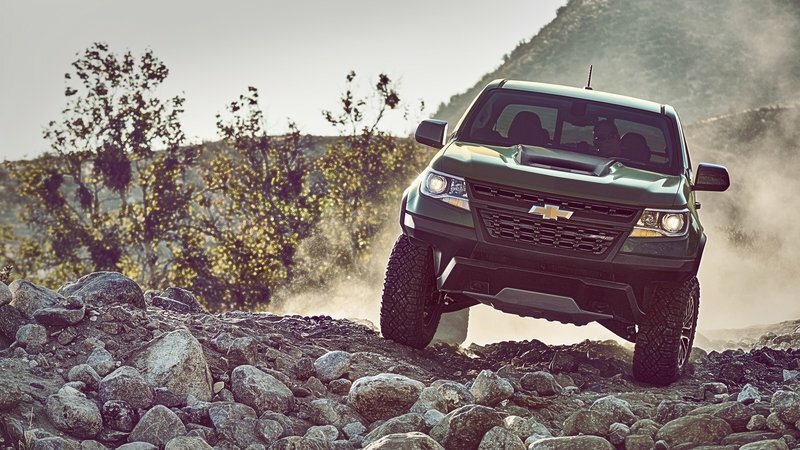 Thankfully all that came to a head at the 2016 L.A. Auto Show as GM pulled the covers back, revealing a pickup designed to tackle the worst terrains on the planet while still being able to fit in your garage. Oh, it also fits down the Rubicon trail, as well – something not feasible with a larger truck that’s also built for dedicated off-roading. The 2017 Chevrolet Colorado ZR2 is GM’s newest halo vehicle and carries plenty of high-tech features and technology that makes it worthy of its position. For starters, the truck rides on spool valve shock absorbers from Multimatatic – the same company that supplies spool valve shocks to Formula One race teams, Aston Martin for use in its outrageous One-77, and Chevy’s fifth-generation Camaro Z/28 engineering team. This makes the ZR2 the first non supercar to use spool valve shocks. This is also the first time spool valve shocks have been used in an off-road application. 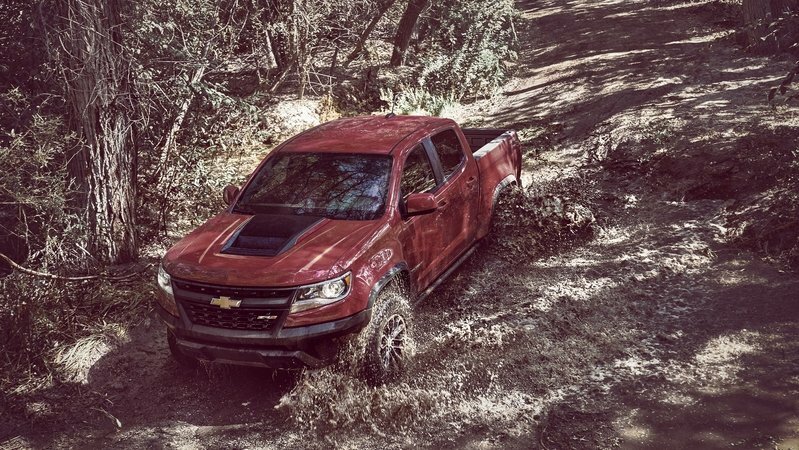 Chevy also gave the Colorado ZR2 a sophisticated software program that augments things like the ABS, traction control, and 4WD system to squeeze every last ounce of capability out of the truck. Hardware wise, the Colorado ZR2 has a wider track for better high-speed stability, a two-inch suspension lift over the stock Colorado, beefed up control arms and leaf springs, and ZR2-specific bodywork that allows for greater approach and departure angles. The ZR2 even features rock sliders that protect the doors and rocker panels from damage. Despite all the changes, Chevy kept the Colorado’s powertrain intact. The ZR2 comes standard with the familiar-yet-revised 3.6-liter, gasoline-powered V-6, but the 2.8-liter, Duramax, four-cylinder turbodiesel is available as an option. This only scratches the surface of the 2017 Colorado ZR2, so keep reading for a deep dive into the truck’s looks, interior, powertrain, suspension, and competition. Continue reading to learn more about the Chevrolet Colorado ZR2. The ZR2 codename harks back to the second-generation Chevrolet S-10 pickup. Debuting for the 1994 model year, the S-10 ZR2 featured a wider track, increased ground clearance, standard skid plates, 31-inch all-terrain tires, and Bilstein Monotube shocks. The ZR2 wasn’t so much an off-road racer or factory Baja truck, but rather a lifted truck designed to appeal to those wanting more capability than the standard S-10 4WD. The ZR2 name expanded to the Blazer for the 1996 model year and was even offered on the compact Tracker crossover. The name slowly died off with the Tracker, Blazer, and S-10’s demise, ending production with the Blazer in 2005. The 2017 Chevy Colorado ZR2 might be based on the standard Colorado, but Chevy has given it a very distinctive appearance from nearly every angle. Only the roof, doors, and tailgate remain unchanged. Everything else has a bespoke look that is based in function, not just form. Customers can choose between the Extended or Crew Cab versions. The front bumper is completely new and features large cut-outs ahead of the tires to improve the approach angle. Below, an aluminum skid plate protects the radiator and engine oil pan. Exposed tow hooks make vehicle recovery a breeze. The grille is more on the aesthetic side. It has a new insert with the ZR2 logo. Its outlining bars match the bumpers black plastic hew for a seamless look. The 2017 Chevy Colorado ZR2 might be based on the standard Colorado, but Chevy has given it a very distinctive appearance from nearly every angle. The hood is completely new for he Colorado ZR2 and recalls the heat-reduction hood found on the 2017 Chevrolet Camaro ZL1. And, like the Camaro, this hood features a vent to help keep temperatures in check. The engine logo also adorns the matt-black bulge, accented by chrome strips. Accommodating the ZR2’s wider track, the front fenders have been widened. Plastic fender flares run from the bumper and help protect the paint from rock chips. Around back, the rear fenders are equally flared, giving the truck its broad-shouldered appearance. Matching black flares continue the rugged theme. Even the rear bumper is different than the standard Colorado’s. It’s missing the low-hanging corner steps, left off to improve the truck’s departure angle. Customers focused on utility will be glad to see the two-inch receiver hitch still remains, as does a 5,000-pound towing capacity. Payload is capped at 1,100 pounds. Customers will also have the option of selecting the bed-mounted spare tire carrier. It’s designed to place the full-size spare tire out of harm’s way and improving the departure angle. It also makes it easy to access, though it does dramatically reduce the truck’s available cargo space. The tire also sticks up above the bed rails, making it impossible to install a tonneau cover. Still, the functionally over form theme is impressive, as is the obvious dedication to making a no-holds-barred, Baja-ready truck. The Colorado ZR2’s functionally continues along its rocker panels. 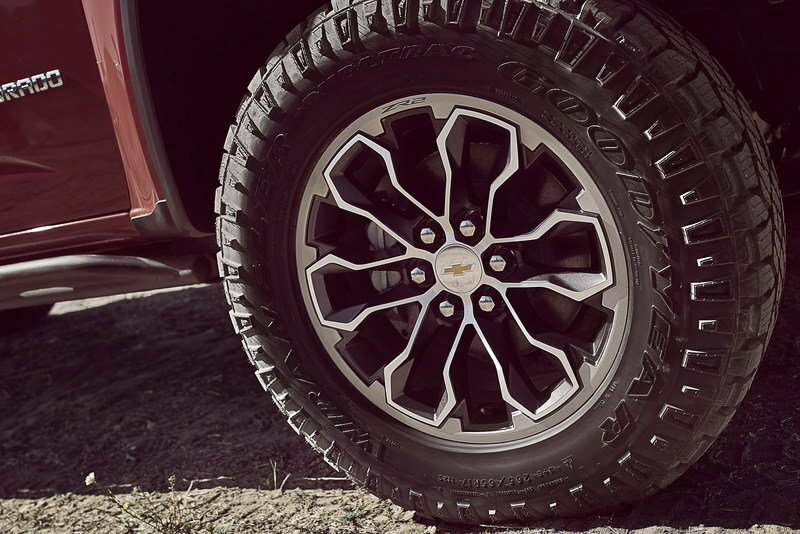 Chevy includes a tube-steel rock slider that’s capable of holding the truck’s weight as it scoots across tall terrain like boulders or fallen trees. The bars are designed to protect the vulnerable door sills and rocker panels. The ZR2 rides on a set of 17x8-inch aluminum wheels with painted pockets. They’re wrapped with 31-inch Goodyear Duratrac tires. The Duratracs are becoming increasingly popular in the industry today thanks to their good on-road manners despite their all-terrain traction and Triple Peak winter tire rating. While technically not a direct competitor in terms of size, the Colorado ZR2 will always be compared with the Ford Raptor. The Raptor basically invented the high-speed off-roading segment for production trucks in 2010 and has dominated the scene ever since. Now for the 2017 model year, the Raptor is back and better than ever. New technology and a high-output 3.5-liter EcoBoost V-6 pushes the Ford to new levels of awesomeness. 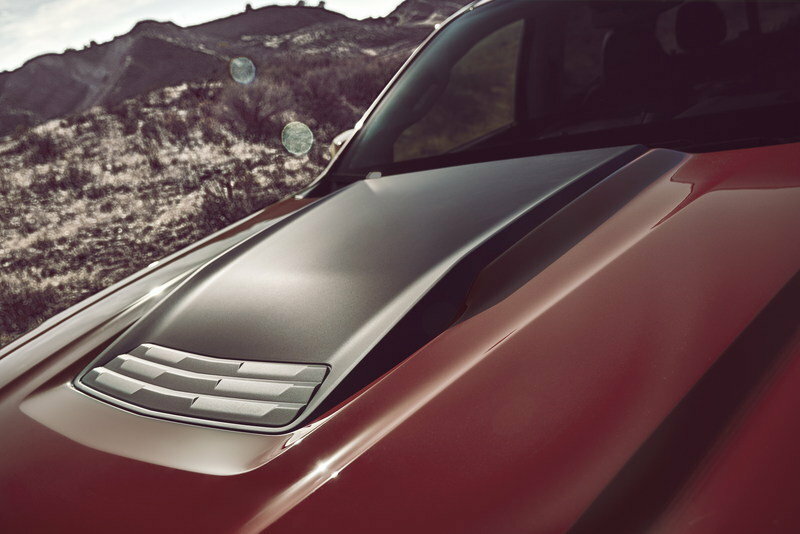 Matching that vibe is the truck’s bespoke exterior. A Raptor-exclusive grille, fenders, bumpers, wheels, and tires all give the truck a macho, and purpose-built appearance. This isn’t’ a truck you’d want to meet in a dark alley on the way to the Baja 1000. The Colorado ZR2’s closest competitor is the Toyota Tacoma TRD Pro. All-new for the 2017 model year, Toyota has given the Taco Supreme a unique appearance from the rest of the Tacoma lineup. A blacked-out grille with block TOYOTA lettering recalls iconic Toyotas of the past while matching the rest of Toyota’s TRD Pro lineup. Slightly wider fenders and a hood scoop help set the truck apart, while the bed features the TRD Pro logo stamped into its sheet metal. The Tacoma TRD Pro looks awesome, but is definitely the mildest of the three trucks. 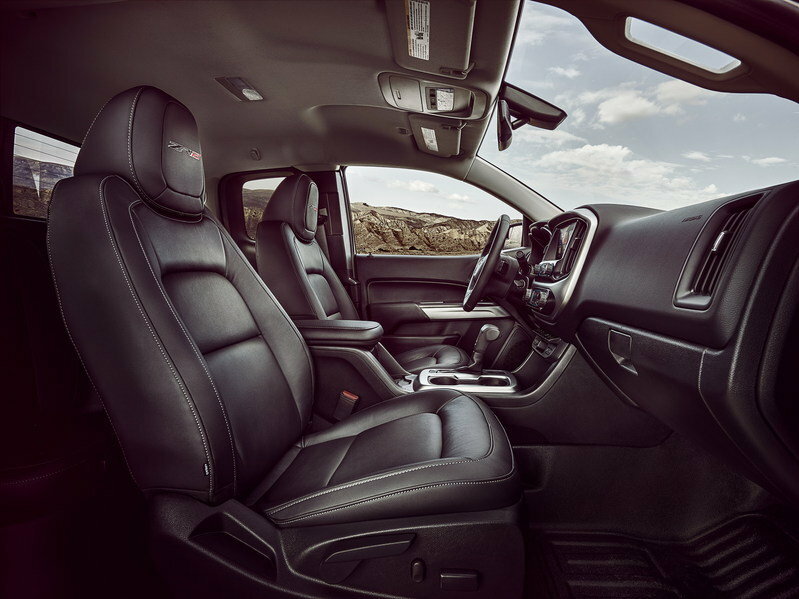 Chevrolet didn’t do much with the Colorado ZR2’s interior. In fact, the biggest change is the new leather-wrapped seats with the ZR2 logo embroidered on the headrest. New rocker switches reside on the center console that operate the front and rear locking differentials, but you’d have to be familiar with the Colorado before you’d notice the change. Still, the Colorado ZR2 offers a comfortable place to sit. The biggest change is the new leather-wrapped seats with the ZR2 logo embroidered on the headrest. The dash features Chevy’s latest MyLink infotainment system. The eight-inch screen is fully color and is touch-sensitive. The software includes Apple CarPlay and Android Auto, along with an optional integrated navigation system. AM/FM/CD/Bluetooth/AUX/SiriusXM is also included as standard, though you’ll have to pay for that SiriusXM subscription. There’s also a new wireless cell phone charger just aft of the gear shift. Comfort and convenience items include heated front seats, automatic climate control, redundant controls on the steering wheel, and power-operated mirrors, door locks, windows, and driver seat. Sadly, the ZR2 is saddled with the Colorado’s dull instrument cluster and small driver information display. 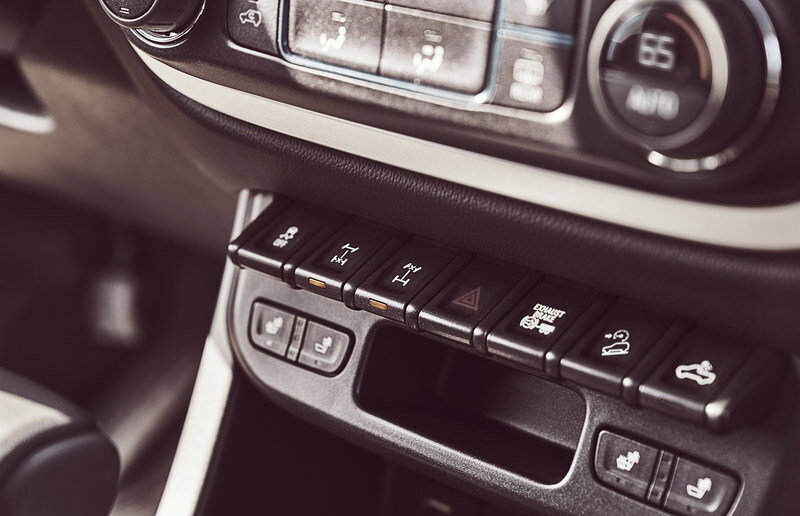 Manual shifting of the transmission must be done via the rocker button on the end of the gear shifter, a big departure from the Tacoma and Raptor. The Raptor boasts an interior that’s the most different from its standard counterpart. The steering wheel features an on-center marker, contrast stitching, and huge F1-style paddle shifters for the 10-speed automatic transmission. The dash also has a unique 4WD selector switch that’s unique to the Raptor. The seats can be had in either cloth or leather, and an optional contrast color package can be had. Several colors are available and carry throughout the cabin, including all the contrast stitching and the steering wheel center marker. The Tacoma TRD Pro takes after the Colorado ZR2 by not offering a substantially different interior. While the Tacoma’s interior is still fresh from its 2016 redesign, the truck could use some differentiating elements that make the TRD Pro purchase seem a little more worthwhile. 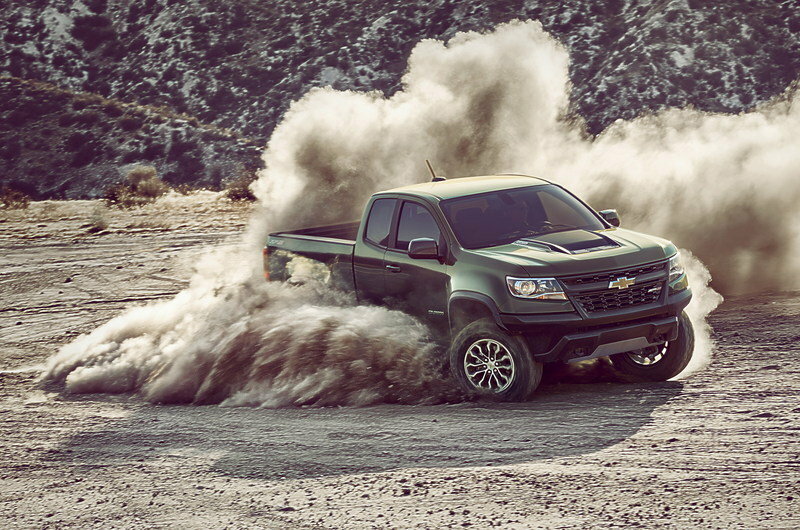 Coming standard with the Colorado ZR2 is Chevy’s newly updated 3.6-liter V-6. It features an updated variable valve timing system on both the intake and exhaust sides, the direct fuel injection system is also heavily improved, and the engine now features Active Fuel Management, or cylinder deactivation, for the first time. These improvements help the V-6 get better gas mileage while also adding power. Horsepower is up from 305 to 308 and torque jumps from 269 to 275 pound-feet. Mated to the gasoline engine is GM’s familiar Hydra-Matic 8L45 eight-speed automatic transmission, replacing the 6L80 six-speed automatic. 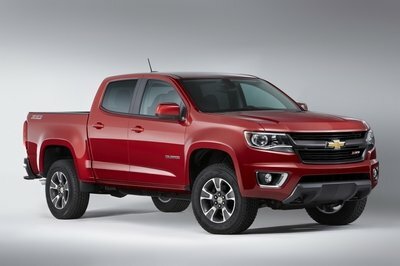 These updates are found across the Colorado lineup, so the ZR2 isn’t getting anything special. The V-6 features an updated variable valve timing system on both the intake and exhaust sides, the direct fuel injection system is also heavily improved, and the engine now features Active Fuel Management, or cylinder deactivation, for the first time. Optionally, customers can get the torque-rich 2.8-liter, Duramax, four-cylinder turbodiesel. This inline oil burner is unchanged from 2016 and produces 181 horsepower and 369 pound-feet of torque. The peppy turbodiesel comes mated to the Hydra-Matic 6L50 six-speed automatic. 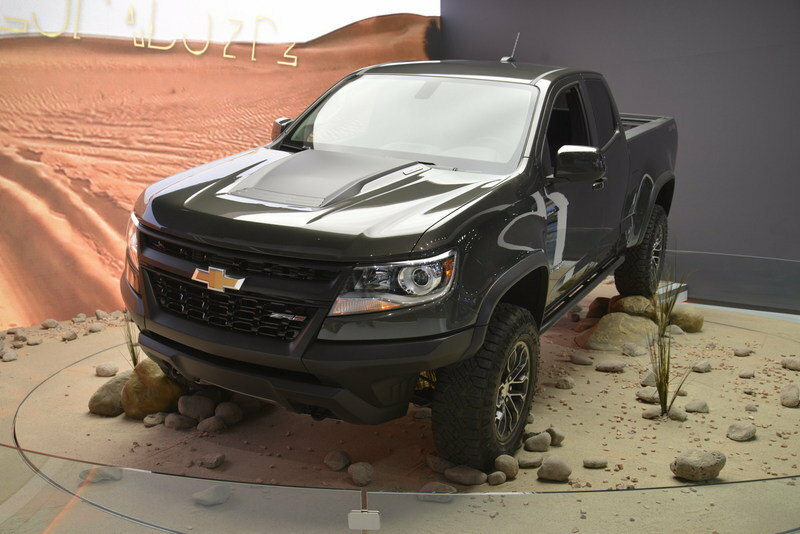 The Colorado ZR2 compromises on payload and towing capacity due to its softer suspension system. 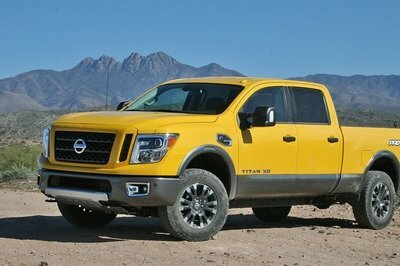 Towing is down from 7,600 pounds with the diesel to 5,000 pounds, regardless of engine choice. Payload is also reduced by roughly 400 pounds to 1,100 pounds. Of course, both engines are connected to The ZR2’s two-speed transfer case. The ZR2’s 4WD system is a throwback to old-school tech with some new-school technology. The two-speed transfer case is electronically operated and features 2WD high range, 4WD high range, and 4WD low range. Electronically controlled locking differentials reside in the front and rear axles, allowing for full lock-up of the drivetrain for serious traction needs. What’s more, the 4WD system also includes an “Off-Road Mode” button that modifies the traction control, stability control, ABS, and hill-descent control to offer a less-intrusive nanny system for when the more slip is needed and more sideways motions are expected. The 2017 Ford Raptor is by far the most powerful truck of the bunch, and not just because it’s a full-size model. Ford developed a high-output version of the heavily revised 3.5-liter EcoBoost V-6 found in the 2017 F-150. The twin-turbocharged V-6 kicks out an impressive 450 horsepower and 510 pound-feet of torque. It comes mated to an equally new 10-speed automatic transmission that was jointly developed with GM. The 2017 Camaro ZL1 also shares the new gearbox. The Raptor is estimated to hit 60 mph in roughly 6.2 seconds – far faster than either the Colorado ZR2 or the Tacoma TRD Pro. Speaking of the TRD Pro, it uses the same 3.5-liter V-6 that’s used in the conventional Tacoma. The engine came new with the Tacoma’s latest redesign and features both the Atkinson and Otto combustion cycles, direct and port fuel injection, and variable valve timing on both intake and exhaust sides. Despite the tech, the V-6 only musters 278 horsepower and 265 pound-feet of toque. Fuel economy was obviously the main target with Toyota engineers. Both the Raptor and Tacoma TRD Pro use highly sophisticated, driver-selectable electronics that adjusts for different terrain. Ford’s Terrain Management system dials in Normal, Weather, Sport, Mud/Sand, Comfort, and Baja modes. Each automatically adjusts the 4WD system and locking rear differential to accommodate for the selected terrain. 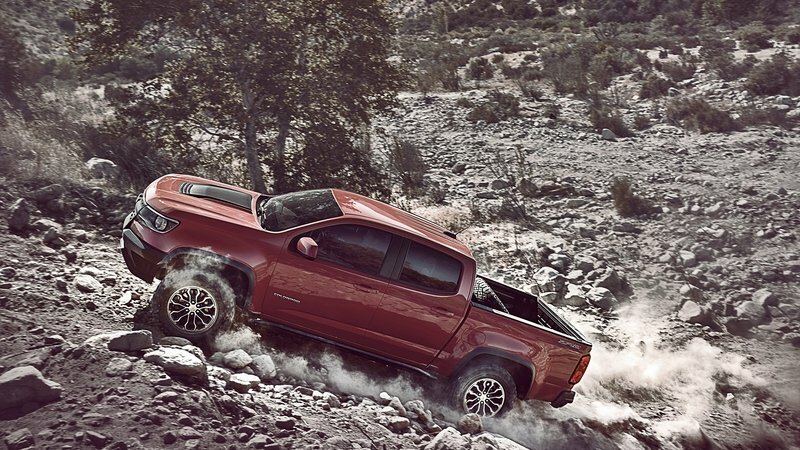 The Tacoma features a similar system and adds the familiar Crawl Control. It’s basically an off-road cruise control that modulates the throttle and brakes while keeping a driver-set speed on rough terrain. At the heart of the 2017 Chevrolet Colorado ZR2 is its high-tech suspension system. The basic design of the suspension system isn’t new or different, but it’s the shocks that really add spice. The front features MacPherson struts with a shock absorber mounted inside a coil spring. Out back, leaf springs hold the solid axle in place, while shocks dampen the axle’s movements. The ZR2’s track is also 3.5 inches wider than the standard Colorado. The front control arms are also unique to the ZR2. They are cast-iron like your grandmother’s frying pan for strength and long-term durability. They might not be as light as the Raptor’s aluminum control arms, but don’t expect a ZR2 to have issues with these components. The basic design of the suspension system isn’t new or different, but it’s the shocks that really add spice. It’s the Multimatic spool valve dampers that are the headlining feature of the ZR2. 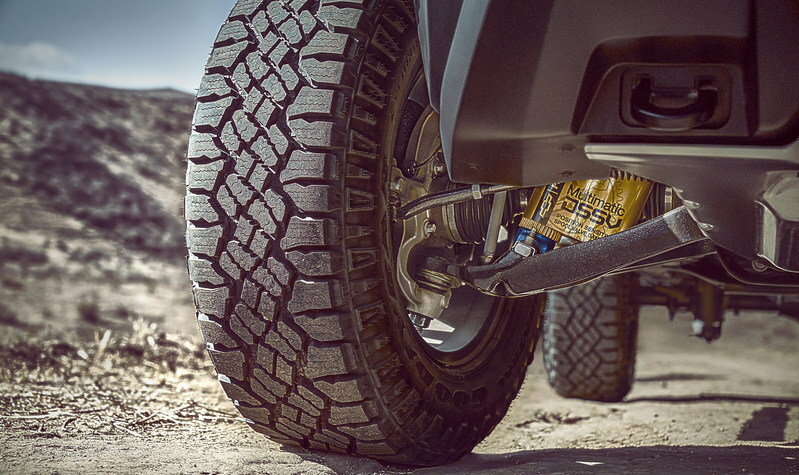 The shocks are said to offer increased precision and manufacturing repeatability, enhanced ride, and improved handling in both on- and off-road situations. The shocks work by using spool valves mounted inside the main aluminum body. This gives the shocks different compression rates at different positions within its travel. Inside, two spool valves provide both compression and rebound damping that is said to be optimized for everyday driving. When the road gets bumpy, a third, piston-mounted spool valve gives additional compression damping. The front shocks also feature an extra rebound valve that stops the sudden jerk felt when the suspension fully decompresses – say mid-air as the truck is flying over a jump. Pop a ruler out as the ZR2 flies overhead, and you’ll see it has a full 8.6 inches of wheel travel up front and an impressive 10 inches travel in the rear. In short, these new Multimatic spool valve shocks are supposed to be the latest and greatest in off-road shock technology. Only a back-to-back comparison between the Ford Raptor and Toyota Tacoma TRD Pro will tell for sure whether these new shocks are better than the competition. The Ford Raptor uses the same suspension setup it has had since its introduction, though the parts have improved. Up front, MacPherson struts are mounted to aluminum control arms and feature remote-reservoir Fox Racing shocks that are three inches in diameter. The shocks have nine compression zones throughout its full travel, with the highest zone acting as a hydraulic bump stop. Out back, Raptor-specific leaf springs do most of the work while remote-reservoir Fox shocks keep motion to a minimum. The Raptor features a whopping 13 inches of wheel travel in the front and 13.9 inches in the rear. Like the Raptor, the Tacoma TRD Pro uses Fox Racing shocks, though they are completely different in size and tuning. The Taco uses 2.5-inch shock bodies that are internally bypassed. A MacPherson strut is used up front and leaf springs are found in back, just like the other trucks. The TRD Pro also features a one-inch suspension lift up front compared to the standard Tacoma. Suspension travel distances aren’t readily available for the Tacoma, however. Chevrolet has not announced pricing for the 2017 Colorado ZR2, though the truck has a narrow gap to work with. The 2017 Tacoma TRD Pro starts at $40,760 while the 2017 Ford Raptor starts at $48,325. 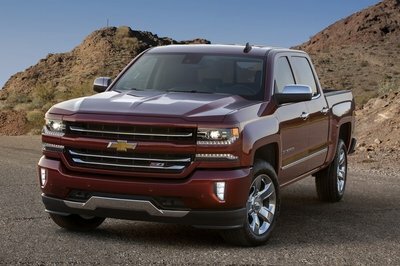 We suspect Chevy will shoot for the middle, going with a base price of $45,000 for a Crew Cab diesel model. 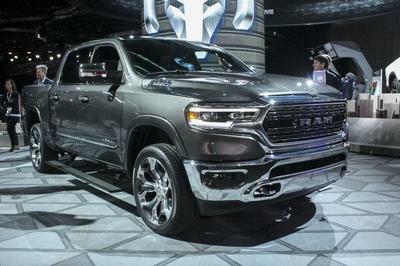 Perhaps the Extended Cab with the gasoline engine will start lower, maybe around $41,000. Expect a fully loaded ZR2 with all the trimmings to break the $50,000 barrier. The Ford Raptor basically invented the high-speed off-road segment in 2010 when the first-generation truck launched. Though Ford thought the Raptor would be a short-lived special edition, the Raptor caught on and is now in its second generation. The 2017 model year brings all the advancements found in the 2015 F-150. 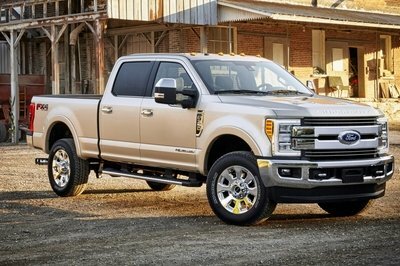 Ford went further, however, by adding a reinforced frame, high-output EcoBoost V-6 engine, and an exclusive 4WD system. The result is the industry’s current reigning champ of production desert racing. 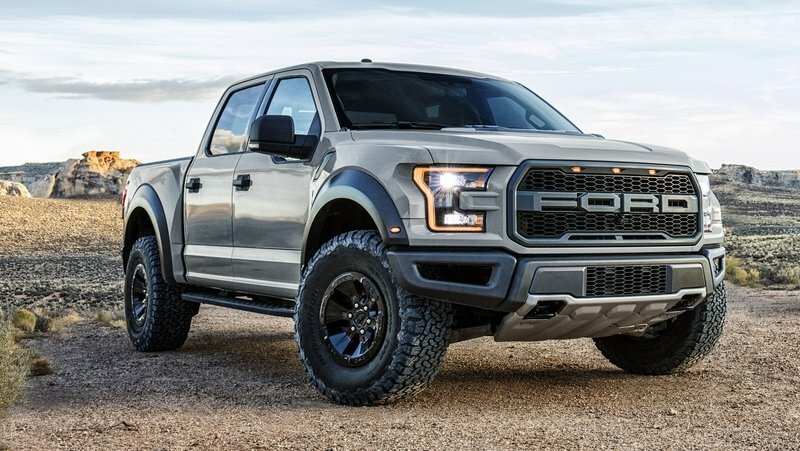 Read more about the 2017 Ford F-150 Raptor here. The Tacoma TRD Pro is also in its second generation, though it hasn’t been around very long. 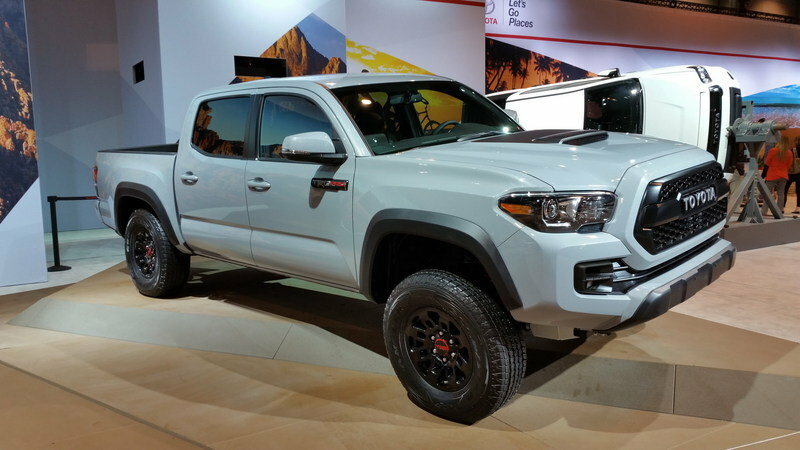 The TRD Pro moniker got its start for the 2015 model year, right at the tail-end of the second-generation Tacoma’s life cycle. Now a year removed for the third-generation’s introduction, the 2017 Taco Supreme brings all the same advances found on the standard truck, but sprinkled with high-end off-road equipment. Unlike the Raptor, the Tacoma TRD Pro uses the same 3.5-liter V-6 as the conventional truck. It features a ton of fuel-saving technology like variable valve timing, both Atkinson and Otto combustion cycles, and both direct and port fuel injection. Sadly none of these technologies gives the V-6 any meaningful power increase. It makes do with 278 horsepower and 265 pound-feet of torque. Then again, the Tacoma will likely have the most frugal fuel bill, save for the Duramax-equipped Colorado. Even then, the more expensive diesel fuel will likely offset the savings. Find out more about the 2017 Toyota Tacoma TRD Pro here. The wait for the Colorado ZR2 is finally over. All the spy shots, rumors, and speculation can be put to bed and customers can start pickup up their trucks beginning in the early parts of 2017. The suspension advancements and the radical bodywork are undoubtedly the highlights of this truck and will surely work to sell hoards of ZR2 off dealer lots. 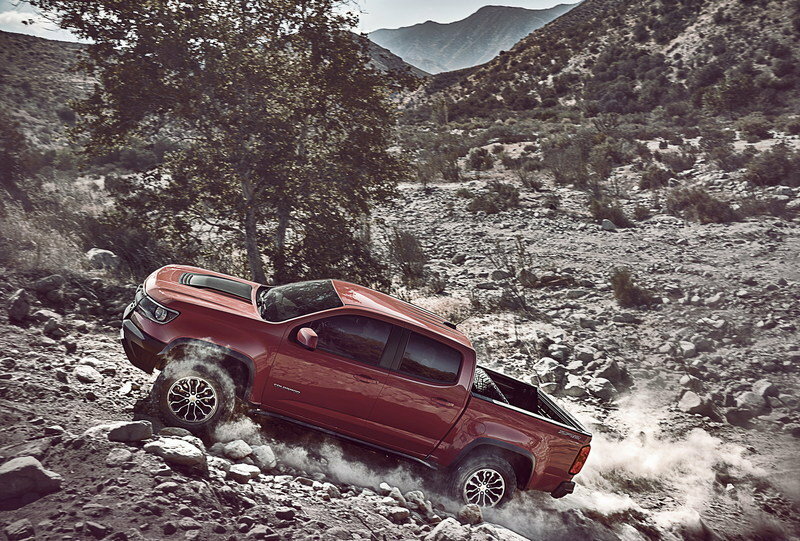 While this isn’t the first ZR2-named mid-size pickup from Chevrolet, it certainly is the most capable and most purpose-built for off-roading. We just can’t wait to get our turn behind the wheel. And believe us, when that time comes, we’ll have a detailed review for your reading enjoyment.